Structured settlements are often discussed, yet seldom clearly understood in relation to personal injury lawsuits and cases in the Central Florida and Orlando metropolitan area. Recently on television there have been several commercials and advertisements about structured settlements, and we feel that it is important for our clients and others to fully understand exactly what they are, plus the pros and cons associated with them. A structured settlement agreement is a type of settlement in a personal injury case where the injured party agrees to accept periodic payments instead of a lump sum payment for his or her damages in an personal injury claim. A structured settlement is simply a way to take your settlement proceeds and turn them into a tax free stream of income. It is agreed by both the injured party (the plaintiff) and the responsible party or their insurance company (the defendant) that to resolve and expedite the process, monetary damages are paid in scheduled periodic time periods instead of all at once. If either requested by the injury party or offered by the defendants, the objective of the structured settlement is two fold. First, it will save the insurance company some money upfront. Second, it allows the injured party (plaintiff) to ultimately receive more money than he or she would have had they accepted a lump sum (one payment) settlement. Obviously, both parties involved must agree to enter into the structured settlement and then agree on the terms of the payments. Initially utilized to settle product liability cases by drug manufacturers in pharmaceutical injury cases (such as the famous Thalidomide settlement in 1968 for 68 children with birth defects), structured settlements are now commonly seen in a variety of personal injury cases. They have become a part of the statutory tort law in the United States, and are also commonly referred to as periodical payments and structured judgments. The structured settlement payments are often funded by the purchase and use of annuities to generate the future money. Today, this kind of payment is commonly seen in catastrophic injury cases. Such injuries often put the injury party (or family) in a difficult financial position as many of these injuries require the injured person to adapt to a new (and not necessarily better) way of life. Plus, many people do not have the financial expertise to manage large sums of money. This lack of expertise can lead to serious financial trouble for the injured person. A person who loses funds intended to cover a lifetime of medical care runs the risk of losing medical care and independence. 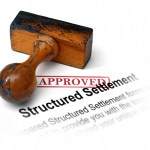 structured settlements are commonly used in large settlement cases. Further, they are required when the injured person is a minor (under the age of 18 in Florida) and the settlement amount is over a certain amount of money. If you and your attorney agree to explore a structured settlement, your attorney will contact a structured settlement expert to work with the insurance company’s expert to come up with a plan that is acceptable to all parties. These experts can calculate what the true benefit of the structured settlement will be for the injured party. And the insurance company usually pays the costs of the injured party’s structured settlement fees. In 1982, the federal government passed the Periodic Payment Settlement Act of 1982 (Public Law 97-473) to protect claimants awarded with cash sums from personal injury and wrongful death lawsuits from quickly depleting their assets and then falling on public assistance to meet their needs, which is a serious risk, no matter how large the settlement. For example, insurance industry statistics from The Rutter Group show 25 – 30 percent of accident victims use all the funds from their judgments within two months of recovery, and most cash settlements last less than a few years. To protect injured persons claimants from such financial problems, the Act created a powerful tax incentive for the use of structured settlements, a type of annuity that converts a one-time award from a lawsuit into a series of income payments that can last up to a claimant’s entire lifetime. A structured settlement offers numerous advantages such as the security of long-term guaranteed income. They also provide a way to avoid financial loss due to poor investments that may be seen with a lump sum settlement. Structured settlements provide a secure, low-risk source of compensation and the convenience of regular payments tailored to fit the victim’s specific needs. Another advantage is the Act explicitly provides that 100 percent of every structured settlement payment would be exempt from federal and state income taxes. One of the biggest advantages is that the injured person avoids the risk of mismanaging a lump sum settlement. As mentioned above statistics show that about 25 to 30% of all accident victims completely burn through all their settlement money within two months of receiving it and 90% of them spend it all within five years. The major benefit of a structured settlement is that the injured party is able to receive a larger total sum of money than they would by taking a one-time lump sum. This is because the sum that is invested in the annuity (the vehicle used in most structured settlements) grows over the period of time the structured settlement is set up to last. There is less temptation for the injured person to spend all the settlement money in a short period of time. Under a structured settlement, the amount of the payments and the date they payments are to be made are set in advance. Thus the injured person knows that she or he will be receiving a specific amount of money on a specific date. The number of payments that an injured person can receive can vary is and is open for negotiation. Several rulings by the IRS (United States Internal Revenue Service) have proved favorable to structured judgments. The rulings by the IRS mean that injured parties would actually not have to pay Federal income tax on the money that they received from the settlement. Although certain conditions do apply, this ruling applies to both any initial money received by the plaintiff, plus all additional future payments that they receive. The settlement is structured so that the periodic payment of damages are excluded from the individual’s gross income and also from any worker compensation regulations. A structured settlement can, in some cases, preserve all of the recipient’s Medicare benefits. This is true of all federal cases governed by the federally structured settlement laws. However, it is important to note that in addition to the federal laws, structured settlement laws and regulations have also been passed by each of the individual states in the nation. Currently there are thirty-seven (37) states whose laws are based on the NCOIL (National Conference of Insurance Legislators) that are based on preserving a claimant’s Medicare benefits. A portion of future payments received via a structured settlement can be set aside or “dedicated” for future medical advancements. If a “miracle cure” becomes available, this allows an injured individual to try it and perhaps benefit from future medical research. Although the benefits or pros discussed above can make a structured settlement both a viable and lucrative choice in many cases, there are some negatives that should be pointed out. Structured settlements are based on annuity payments from life insurance companies. There is no federal law or agency that oversee situations where the insurance company becomes insolvent, even though federal law does prohibit insurance companies from “officially” declaring bankruptcy. Every state (plus Puerto Rico) does have some sort of a “safety net” in place that ensures that a person continues to be paid. However, these vary from state to state. Most are subject to limits and it is important that before accepting a structured settlement, an individual understands their state’s rules. For more information regarding the state that you live in, we recommend that you visit the National Organization of Life and Health Insurance Guarantee Associations (NOLHGA) website. Most of the time, the injured party’s attorney and expert will require that only an A+ rated insurance company be used to fund the structured settlement. It is vary rare for an A+ rated insurance company to fail. Unpredictable changes in economic conditions such as recession and sky-rocketing inflation are capable of resulting in a plaintiff’s annuity payments becoming too small to meet their projected needs. This can be especially true in the case of minors. Keep in mind that the insurance companies favor structured settlements because they anticipate that the payments will be less costly in the end than a lump-sum settlement might be. As discussed above, personal injury awards from lawsuits are considered to be tax free under the existing tax codes. However, there are certain exceptions to this that can make portions of a settlement taxable. These include interest that may accrue and any money awarded for punitive damages. Additionally, future changes to the tax laws are unforeseeable and could result in negative consequences. I am sure at some point in time we have all seen the commercials on TV where a bunch of people are “singing” about getting your cash now for a structured settlement. You should truly consider whether or not selling (that is what you are doing…….selling your structured settlement) is really in your best interest. In some limited situations, individuals who have received a structured settlement from a personal injury case may experience a substantial change in their personal and/or financial situation which may lead them to consider “selling off” their structured settlement contract. Examples such as unanticipated unemployment, college tuition and unforeseen debt can happen to anyone. Selling the future payments for a lump sum now may be necessary. Such a sale is legal and named a “structured settlement factoring transaction”. Of course, these companies that offer to give you cash now are in business to make money. Do not think for one minute that they are doing you a favor buy “buying” your structured settlement. These companies know the power of how money grows over time. That is why they want to buy your settlement award. they make money on the sale. These companies will try to take advantage of the individual’s circumstances and urgency. Why do you think most of these commercials run late at night? They target people who feel desperate, pressured and boxed in. These people are the ones who will agree to sell their structured settlements now for a relatively small amount of cash. Although the sale of a structured settlement must be approved by a judge at the state level and is not a given, it is very rare that the sale is disallowed. Thus we see the numerous late night television commercials for companies that will buy structured settlement annuities. Yet most of the time the seller will receive only “pennies on the dollar” as compared to what their settlement is actually worth over time. Individuals who receive structured settlement payments should use caution if it becomes necessary to sell or transfer their compensation. The Consumer Financial Protection Bureau (CFPB) has issued a warning to all annuity recipients and stated that certain factoring companies actually aggressively market to and “target persons with disabilities and structured settlement awards”. If you or someone that you care about has any questions about structured settlements and how they actually work, please reach out to us and our experienced staff will do our best to answer your questions. If you have been involved in a car accent that resulted in significant injuries, please consider The Law Office of Mark A. Risi, PA. to represent you. Our experienced car accident attorneys have been serving clients throughout Central Florida for over twenty five years, with clients in Orlando, Winter Park, Lake Mary, Sanford, Apopka, Altamonte Springs, Eustis, Mount Dora, Leesburg and many other cities.